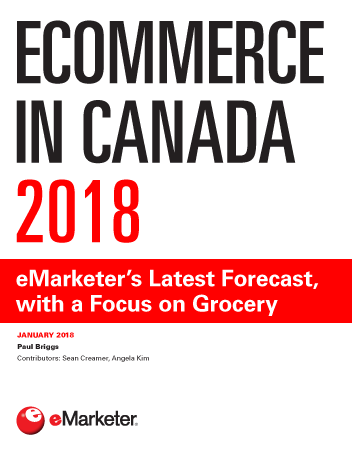 eMarketer estimates retail ecommerce sales in Canada climbed nearly 30% in 2017. Stronger domestic options for online shopping and greater commitments by multinationals to improve ecommerce in Canada are driving this growth. In particular, grocery is rapidly evolving into a true omnichannel sector after years of mixed interest from consumers and merchants. Retail ecommerce will account for 9.0% of total retail sales in Canada this year, as the country’s 19.8 million digital buyers continue to go online for many of their shopping needs. Cross-border shopping is strong in Canada, particularly for merchandise south of the border. Some estimates suggest that almost half of what online shoppers in Canada purchase is from foreign retail sites. The share of mobile-based digital buying continues to expand in Canada. eMarketer expects mobile commerce will account for 30.0% of retail ecommerce and 2.6% of total retail sales in the country this year. Despite this growth, mobile conversions and transactions still trail the rates on desktop. Canada’s grocery sector witnessed the most ecommerce maneuvering in 2017. The industry is facing new pressures from large multinationals, pure play digital grocers and the specter of Amazon’s imminent entry into the space. "Retail ecommerce sales in Canada will reach CA$56.96 billion ($42.99 billion) in 2018, a 26.3% jump from 2017, and account for 9.0% of total retail sales."